Being a busy girl with a thousand things going on at any given moment, I move quickly. People often remark that I never seem to slow down, and in fact when I do get the rare opportunity to move in slow motion, I get very uneasy. Often if I actually sit down on the couch to watch tv (and do nothing else, like mess with my laptop or whatever), I actually fall asleep from the lack of movement. The pace of life where I live, in general, is fast. Being a city girl*, I am used to having to be slightly aggressive when driving. I’m used to getting my words out quickly because we all have other things to do. I’m used to walking with purpose. The pace of life here in Tennessee, where I am helping to take care of my mom (she’s doing very well: thanks to all who have asked about her! ), is way. slower. than. it. is. at. home. Normally, my visits here with Jim and the boys are always four days at the very most, and we have the added irritation and rush of cramming in visits with both sets of parents plus Kate and her family. You’ve gotta move fast to get all that done. It doesn’t gel with the slow pace of living here. In my city mode, I come down with road rage faster. 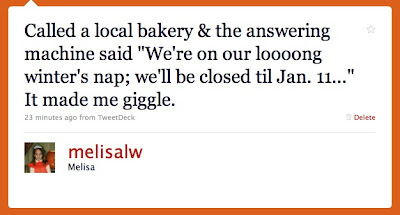 I ooze impatience. In my head, I’m cursing people out constantly for moving too slowly. I’m a city slicker jerk. When I made my plans to come here this time, I was really excited about the chance to slow down for realsies. I remembered being both fascinated and jealous when I read about how the entire city of London had a Slow Down period back in April, and now I was going to get my chance. I’ve been excited about driving less aggressively, speaking slower (after a long weekend here, I usually bring home a slight drawl: I’m going to drive Jim nuts with my accent after 12 days! ), and sauntering instead of speed-walking. So I’m working on it. 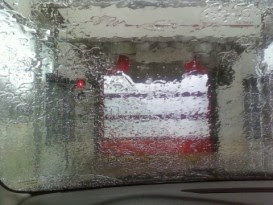 I did actually make some progress in that area; after the long drive down here, my black car was white with salt and it needed to be washed, so on our way to the grocery store we went through the drive thru for a snack** and then headed for the car wash. I drove the car into the little garage-like wash and put it into park. We ate our McDonalds sammies and suddenly “Bad Romance” by Lady Gaga came on the radio. Car wash, McDonalds, and Gaga: the perfect trifecta for two sisters who have nowhere to go in a hurry. It was awesome. See***? Today I’m going to work on completely chewing my food before swallowing. *Okay, okay, I’m technically a suburban girl who feels completely at home in the city. Humor me. ***Use your imagination to picture us eating burgers and jamming to Gaga. Glad to hear your mom's doing well. Boy am I looking forward to your visit. At the arse end of Munich life is S L O O O O W too 😉 but don't worry, we'll make it fun. Drive thru's and fast food south of the Mason-Dixon line make me nuts. There is nothing fast and easy about it. I only ever go that route when I am in a rush or have a craving, thus speed is of the essence. Nice post. Please…chew slowly before swollowing! I'm glad your mom's doing well. Enjoy the life lesson. Kuddos to you for recognizing the gift of the ability to slow down. I can relate to everything you are saying. When we go up to my sisters i really have to practice patience and slow down. It's still NY but upstate NY is nothing like the city! LOL! I'm a city slicker jerk too sometimes but slowing down has its good points and I embrace it when I'm there more than 2 days. 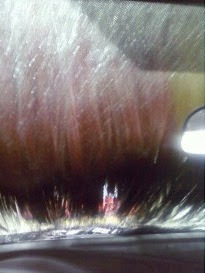 Car wash, Mickey D's and Gaga sound like the perfect sister afternoon. I miss mine…enjoy your time there! Glad mom is doing better. It sounds like you're having a great time, and it's awesome that you & your sister are bonding together 🙂 BIG YAY that your mom is doing well! It's funny- I'm eating lunch as I read your post and the last line made me realize that I am inhaling my food. Ha! Guess I need to work on the same. I'm in high pace mode too often. I think the reason I loved our family vacation back in 2008 was that there wasn't this big rush due to needing to get things done. Any rushing we did was due to happiness, joy, excitement. I think we all need time to slow down and let the stress run away from us. I can relate. I feel like if I don't have an overwhelming sense of so much to do and so little time, something is very wrong. By the fourth day of my four day holiday weekend, I was antsy because I'd run out of things that had to be done. I was actually… ummm… anxious to get back to work! I'm now in enforced slow-down mode. Here's hoping I learn something (if you learn shortcuts, please let me know!). I am exactly the same way-I always have something to do and can't sit for very long. I can't remember the last time I sat through an entire tv show without getting up to do something during the commercial break. And when I have nothing to do, I feel guilty. Except I'm not lucky enough to fall asleep when I stay still. I usually am an insomniac. Hmm. Having never been to TN, the way you describe it, I think it would take me quite a bit of time to get used to it. If I did. I might be with WeaselMomma there. So what day are you back and doing your blood? You neglected that detail (this is in case I forget to respond via email). I can totally see you 2 cracking up in the car wash! I hope the car wash had video of you 2 to play at their holiday party! It is way HARD to slow down, isn't it?! Glad your mom is feeling better and that you're getting the chance to slow down a bit. I know what you mean about picking up the southern drawl again. I can be home for a few days and start showing my hillbilly-ness. I go through that each time to head back to GA to visit my dad. This Jersey Girl can only slow down so much (despite what my husband might say). Previous post: Let’s Make It Official, Shall We?